In a couple of days I return to the UK where the temperature is in the cool 60's and there is an 80% chance of rain. Here its HOT and DRY! 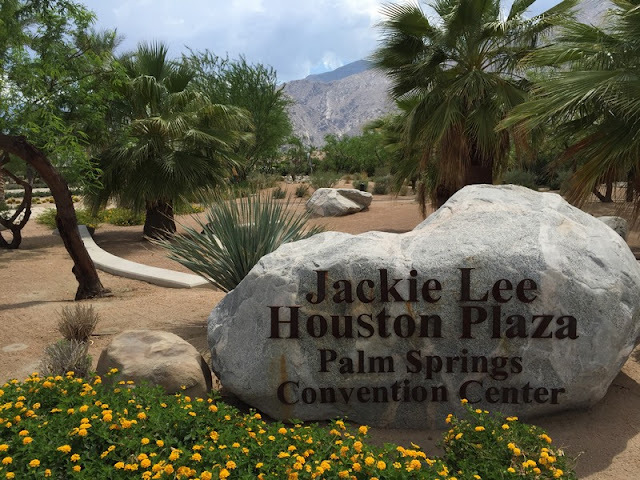 Traditionally Palm Springs has been regarded as a oasis in the desert and has in the past been landscaped with lush plantings and verdant green lawns. In some ways it was the warm climate and the colorful range of plants that attracted us to the desert nearly 15 years ago. 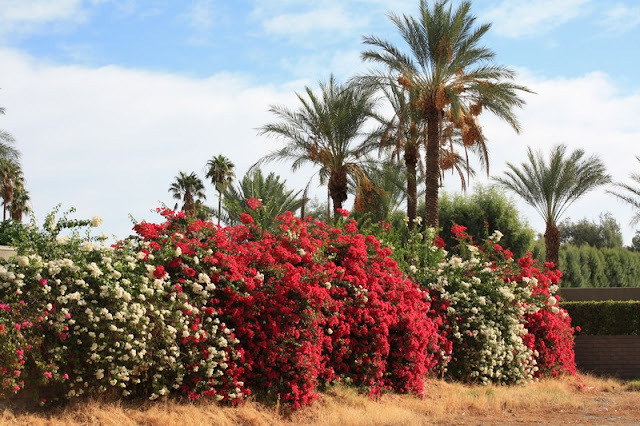 And I have to admit that dazzling pink bougainvilleas, orange bird of paradise and and bright red fire cracker plants still excite me. 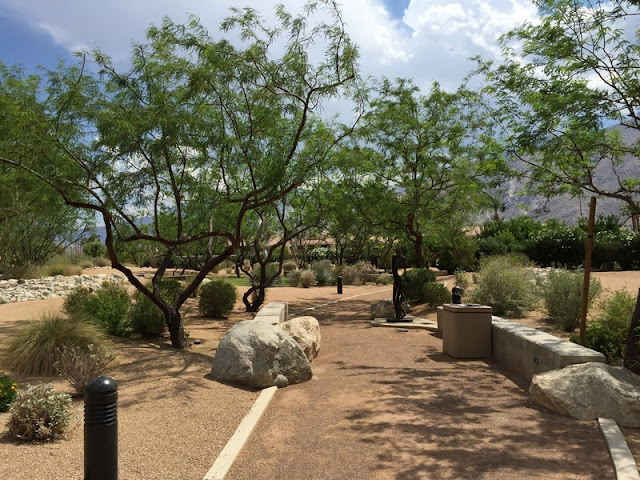 Traditionally landscapes were watered daily and it was a common sight to see water running down the streets from badly adjusted or leaking irrigation equipment. 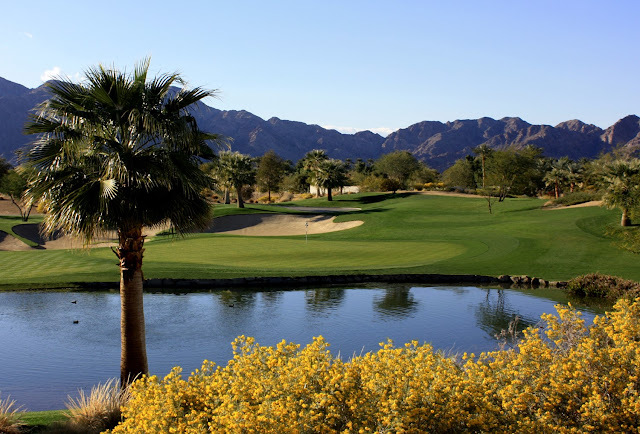 Added to this, there are some 130 golf courses in Palm Springs swallowing an incredible 300 million gallons of water per course. 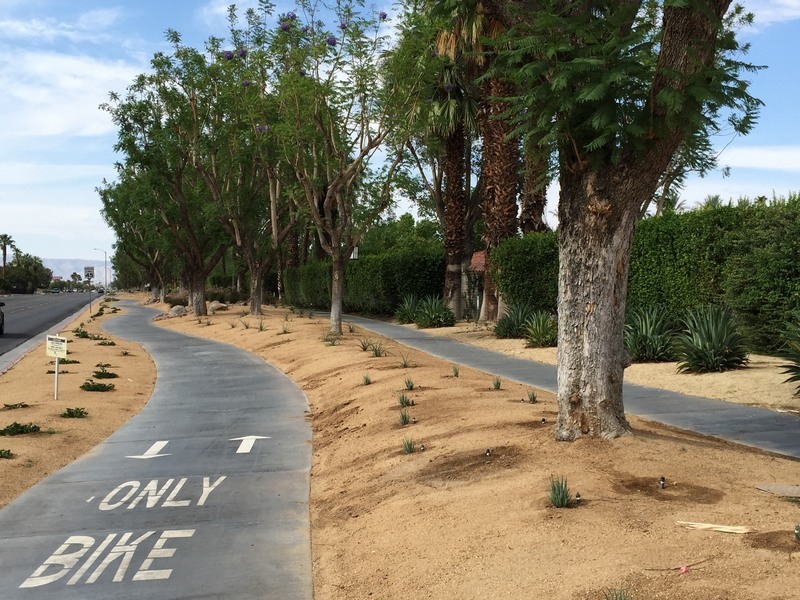 But things are changing and California is experiencing a serious drought. The average rainfall here should be 4.97 inches per year but in recent years with little rain and low mountain snowfall, it has been less than 2 inches and reservoirs are at an all time low. On 1 April 2015 the Governor of California ordered a statewide water restriction, requiring all users to reduce by 25%. Fountains have stopped operating and the local water authorities offer grants to remove lawns and replace with desert planting. 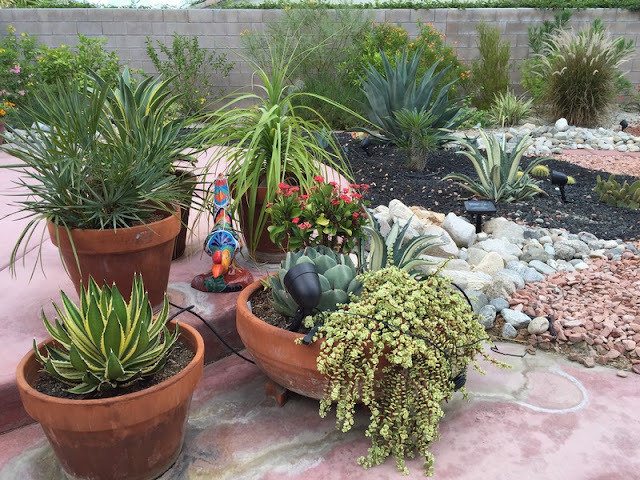 Gardens may only be watered Monday, Wednesday and Friday and only between 7pm and 7am. 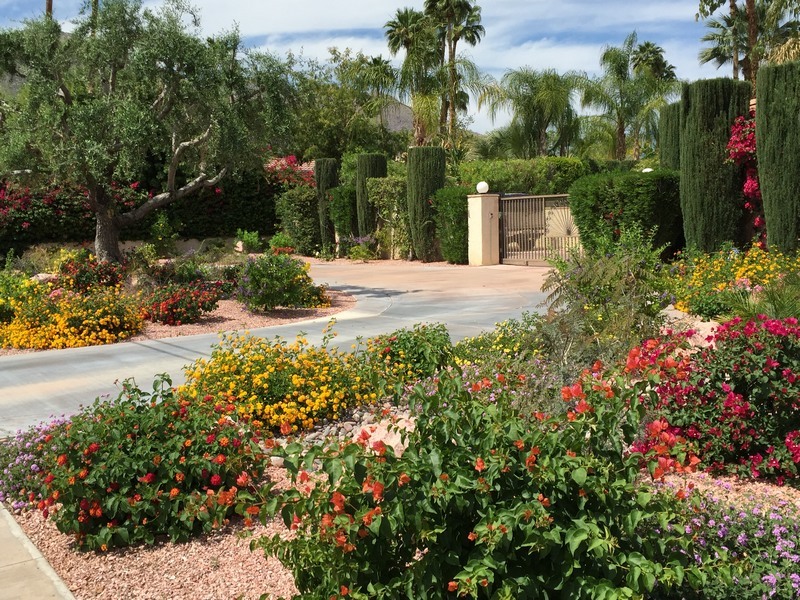 For those that have traditional landscapes, its a question between playing a gamble to see if lawns and planting will survive on such restrictions or investing in the removal of lawns and replacement with drought tolerant planting and gravel. 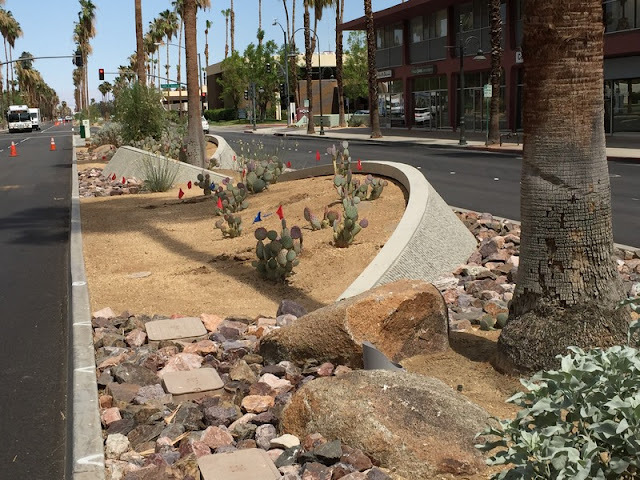 Local water authorities are offering grants for converting grass to desert landscapes. Firms supplying grass maintenance equipment must be seeing dramatic drops in their profits! 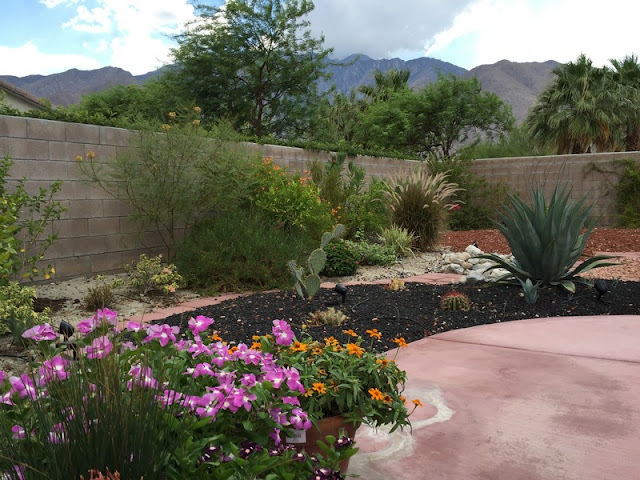 In contrast there must currently be a huge upsurge in new landscape works and nurseries are offering a great range of exciting desert plants. 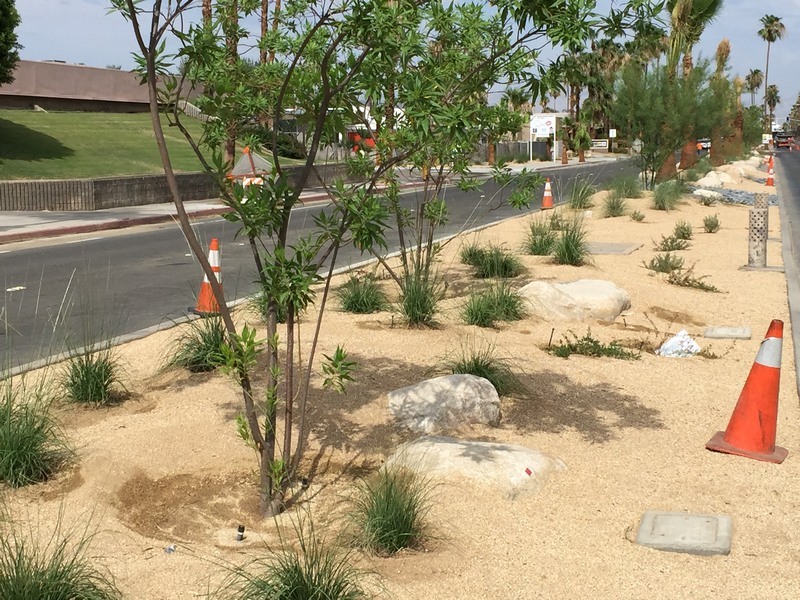 In Palm Springs, the first phase of the Tahquitz Canyon landscaping completed last year has settled in well despite my earlier reservations and the second phase is now nearing completion. Altogether this makes a ribbon of planting from the airport to the town center in total two miles long. 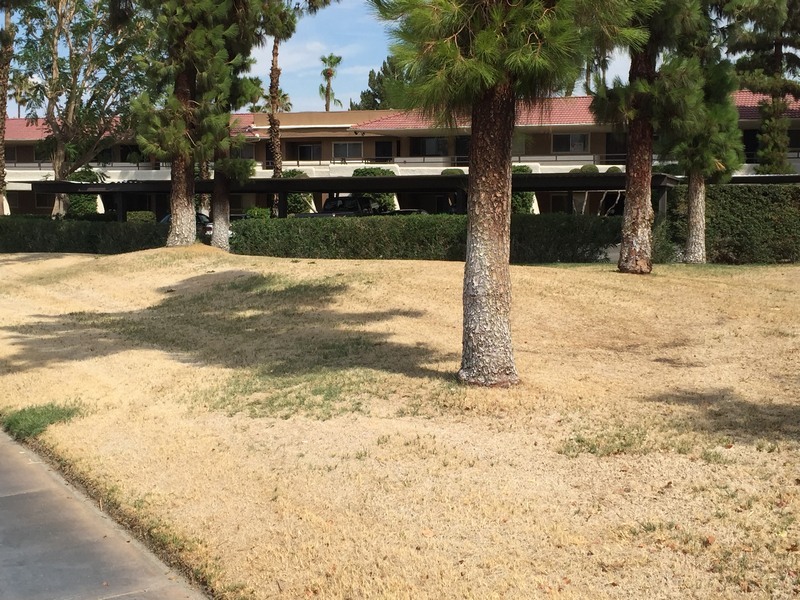 Our local paper, the Desert Sun has made huge changes around its premises, removing huge areas of grass and changing to desert landscape. On a city scale there are many areas of lawn to change to desert landscape. The airport alone has 10 acres of grass. Removing 5 acres of that grass would cost $2 million, a figure beyond the current budget allocation. A less successful scheme. All the grass has gone to be replaced with uniform gravel and a scattering of small plants. 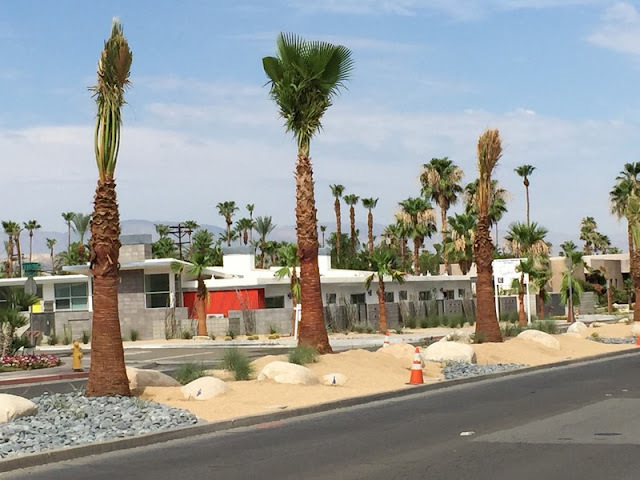 But the big mistake is to leave all the water hungry Jacaranda trees amongst which there are a number of palms. 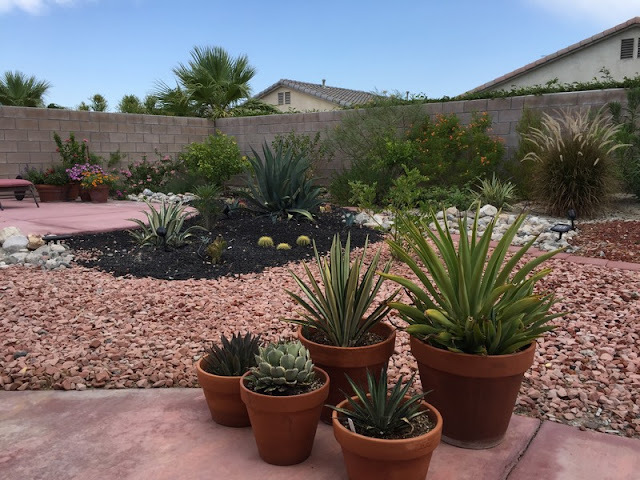 In my own small yard we have a scheme that is mainly colored gravels with a boundary planting of desert shrubs and a bed of cacti and succulents. As renters we have created this on a low budget. 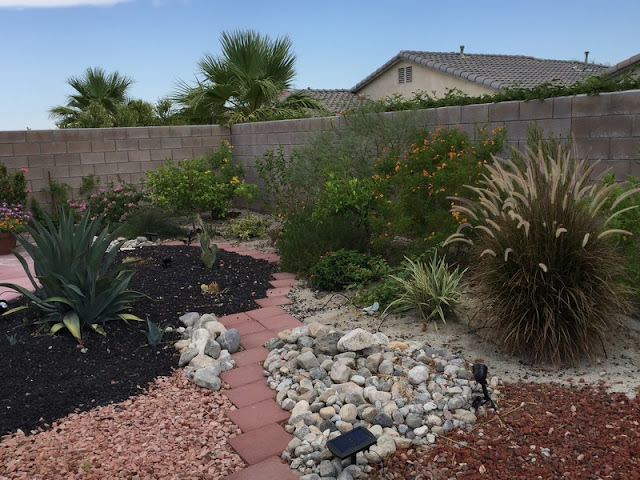 The irrigation is divided between two stations giving less water to the arid plantings and a little more to the shrubby areas. Back in 2006 the UK had a heatwave summer, complete with drought. Soils were bone dry, lawns went straw yellow, plants shriveled and trees performed an early leaf fall well before the normal autumn. 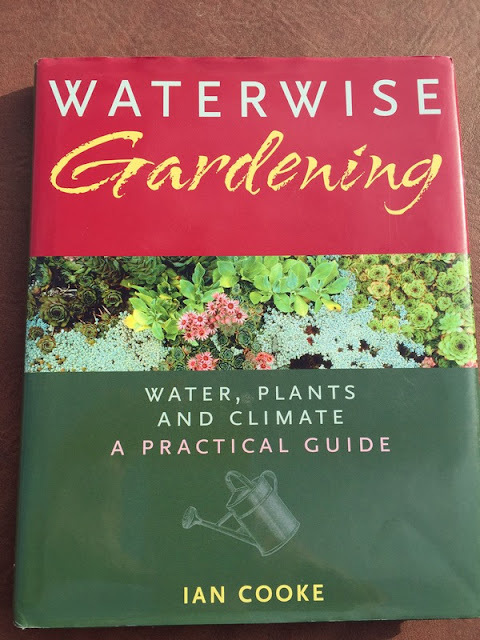 Everyone was quoting climate change and my publishers asked me to write a book on gardening in dry conditions - 'Waterwise Gardening' was the result. Sadly by the time the book was completed and printed, a year or so later, the UK was experiencing severe wet weather and flooding in many areas. Not surprisingly the book didn't reach the bestseller's list! 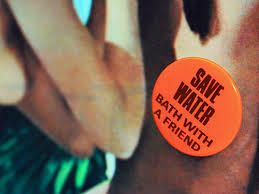 Even further back in the UK in 1976 during another hot dry summer, I recall a slogan that suggested 'Bath with a friend', to which many people added 'on top of your car, in the middle of your lawn. Hmmm - could be interesting! About time...just hope they go all out, and not baby steps, or savings will take much longer...so will keeping up or improving aesthetics! 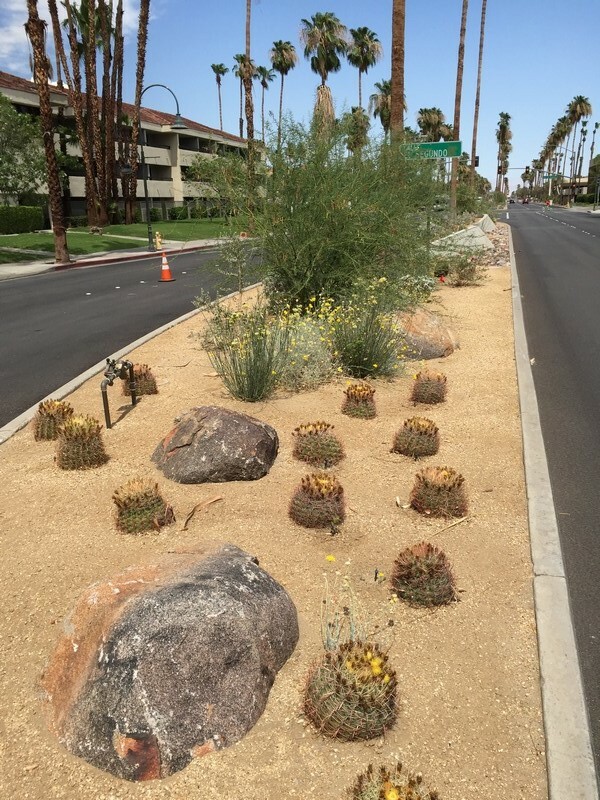 The Tahquitz Canyon streetscape / landscaping - nice land forms and excellent walls, but too many barrel cacti and some other plants - those might crowd the curb and roadway, requiring removal...1/2 of them would have had a better effect. Why don't they put the palms in depressed basins, so it's more like their natural growth in canyons? Existing trees or existing lawns...a real problem when converting to xeriscape...quite a burden to keep, actually. 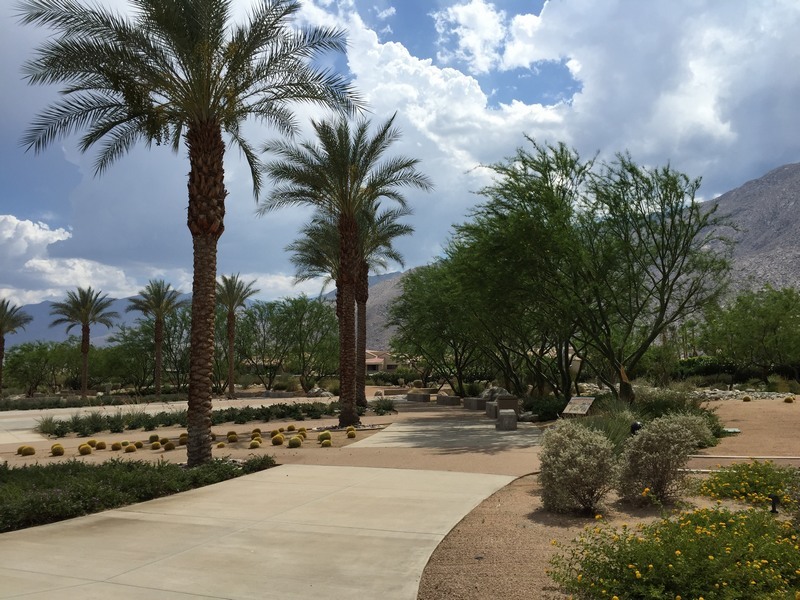 But some are great examples, such as the plaza garden and pathway. Blueberry pancakes but no lobster!